The East Clinton eighth grade volleyball teams, undefeated champions of the SBAAC, are, from left to right, front row, Morgan Michael, Lauren Stonewall, Aubrie Simpson, Cadence Howard; back row, Jozie Jones, Eryn Bowman, Savannah Tolle, Trinity Bain, Megan Tong, coach Jaime Evanshine, Kami Whiteaker, Libby Evanshine, Hayleigh Perdue. Assistant coach Cassie Findley was not present for the photo. 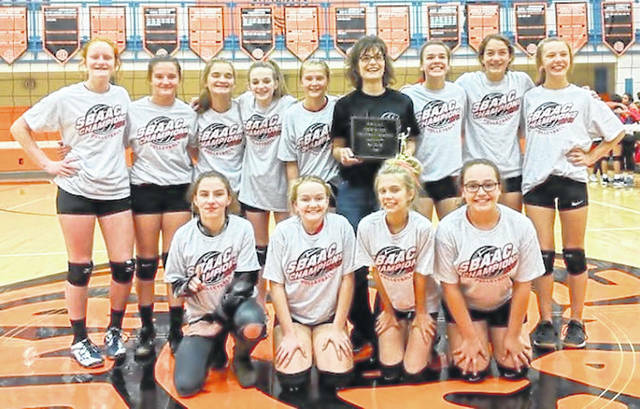 Rallying from a first set loss, the East Clinton eighth grade volleyball team capped its unbeaten season with a win over Goshen in the championship match Wednesday night at Fred Summers Court on the Wilmington City Schools campus. The championship match scores were 24-26, 25-9, 26-24. “It was a superb match,” EC coach Jaime Evanshine said. East Clinton posted a 17-0 record this season and won both the regular season and tournament titles this season. https://www.wnewsj.com/wp-content/uploads/sites/22/2018/10/web1_VOL_ec8champs.jpgThe East Clinton eighth grade volleyball teams, undefeated champions of the SBAAC, are, from left to right, front row, Morgan Michael, Lauren Stonewall, Aubrie Simpson, Cadence Howard; back row, Jozie Jones, Eryn Bowman, Savannah Tolle, Trinity Bain, Megan Tong, coach Jaime Evanshine, Kami Whiteaker, Libby Evanshine, Hayleigh Perdue. Assistant coach Cassie Findley was not present for the photo.